Two games left to save their season! A late Whitehawk goal condemned Hungerford to another defeat pushing them closer to the relegation zone after Poole’s late win against Concord Rangers. In a dire first half Hungerford’s best chance was a Louie Soares’ free kick which went close to nestling in the top corner whilst a deflected volley by Lloyd Macklin for the Hawks was comfortably saved by Marcus Beauchamp. 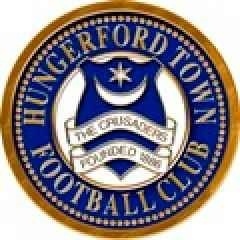 The referee made a controversial decision on 40 minutes when a nicely weighted ball through to Nicholas Bignall was pulled back for a foul to Hungerford leaving the hosts puzzled as to why an advantage wasn’t played. An early free kick for the Crusaders in the second half nearly paid dividends when Alfie Kilgour headed wide. The relegated visitors forced a great save from Beauchamp with 20 minutes to go when a cross floated over to substitute Sam Chaney who volleyed close to the near post. Hungerford should have made it one nil when a nice move ended in Richie Whittingham shooting low forcing the first save out of Dan Wilks. Bignall had another big chance for the hosts when he turned nicely in the penalty box but fired over. Beauchamp was then forced into action again saving low to his near post from Ky Marsh-Brown. Then with just four minutes to go Elliot Benyon ran through on goal and slotted past the goalkeeper to give the visitors the lead. They should have made it two in injury time when a three on one break ended in a Benyon shot being saved again.